Sometimes, for Photo Friday, I try to choose a photo which compliments the theme I’ve been following in my blog posts that week. Other times, a photo posted by another blogger participating in this fun weekly round-up of photos from all over the world influences my choice. And then there’s times when I find that I’ve been chasing my tail all week long and it’s all I can do to find just one decent photo to round out the week with some degree of finesse. I save the noteworthy photos from my (meager) collection for times like that. 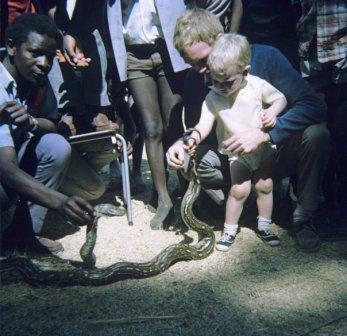 I think this photo fits the bill: the WanderDad at not-quite-two, in rural Zambia with a mammoth snake. Stunning.